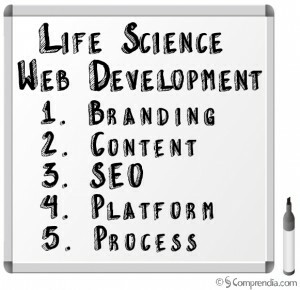 Life science web development is key to many aspects of creating a successful business, from branding, to communicating to customers, to closing sales. These days, it may be the only way that customers know you, and they need to not only be able to find your site, but to find the information they need quickly and easily. Regardless of the size of your life science web development project, we’ll work with you to determine objectives and create a plan that meets your needs. Our web developers and designers will implement the detailed plan within a defined timeline, and will work on a per project or hourly basis, according to your needs. In addition, we’ll guide you through the implementation with creative briefs, templates and resources.